The original Hotel Transylvania was an unremarkable animated effort, offering little appeal for adults who expected more than an onslaught of silly slapstick gags involving random monsters with celebrity voices. But with it's successful box office figures and somehow loyal fanbase, a sequel was never going to be an impossibility, and three years on it's finally here; offering a mixture of surprising and unsurprising results. The plot features Count Dracula (Adam Sandler) celebrating the marriage of his daughter Mavis (Selena Gomez) and her other half Johnny (Andy Samberg), and later the birth of their first child Dennis. When Mavis and Johnny go to visit the human world, Dracula and his colleagues are trusted with babysitting little Dennis; and by babysitting, I mean doing everything they can to make sure Dennis knows how to be a monster whilst his protective parents are out of the picture. 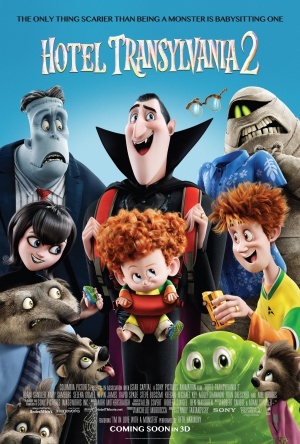 The first problem with Hotel Transylvania 2 is it's abrupt start, with several time jumps skipping over crucial story points and making for a rushed and overly brisk pace. Of course this isn't a film that's meant to boast a rich and complex story, but when you race into the specifics without really explaining much of whats going on, it can make watching a simple kiddie flick an irritating experience. Once the meat of the storyline gets going, and once the initial stupidity tones down, this sequel proves to have substantially more highlights than the original, albeit not enough to help it compete with some of the better animated offerings out there. Product placement and pop culture gags are overdone to the point where they become absolutely unbearable; it's a shame because the film does actually have many moments of witty slapstick and funny albeit silly dialogue. There's also really no substance to the story; it's hollow at it's core, with a lack of focus and a few pointless roles here and there - namely Mel Brooks as Vlad, Dracula's bitter father, who turns up at the last minute for a role that serves no purpose other than to kickstart the climax. But with that in mind, Hotel Transylvania 2 is still a harmless experience that's bound to entertain young children, and even has enough spirit to give some adults a laugh along the way.